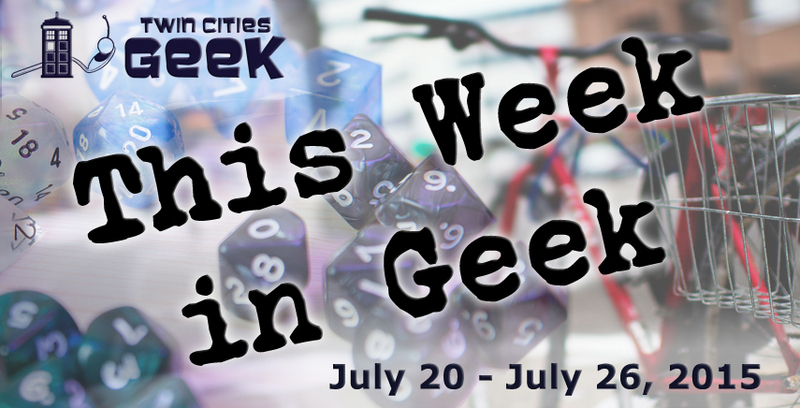 Welcome to This Week in Geek, your guide to events of interest to the Minnesota geek community for the week of Monday, July 20th through Sunday, July 26th. When: Monday, July 20th at 7:00 p.m. Author Ernest Cline will be reading from his new novel Armada tonight at 7:00 p.m. at an event hosted by Common Good Books at the Weyerhaueser Chapel on the campus of Macalester College. Cline’s previous novel, Ready Player One, won a 2012 Alex Award from the American Library Association’s Young Adult Library Services Association division and the 2012 Prometheus Award from the Libertarian Futurist Society, and it is scheduled to be adapted into a film directed by Steven Spielberg. Another event occurring at 7:00 p.m. tonight is the second set of previews for the upcoming Minnesota Fringe Festival, which provides “a forum for anyone with a story to tell.” Selections of 30 shows from this year’s festival will be performed. Admission to this event is free with a 2015 Fringe button if you have already purchased one; buttons will be available at the event if you haven’t. The “official civic celebration of the City of Minneapolis,” the annual Aquatennial event includes the Torchlight Parade (Wednesday at 8:30 p.m.), a water skiing show with a Teenage Mutant Ninja Turtles theme (Thursday at 6:00 and 8:00 p.m.), fireworks along the Mississippi (Saturday at 10:00 p.m.), and more. For more details, check out www.aquatennial.com or download the events program here. When: Thursday, July 23rd at 7:00 p.m. The Geek Partnership Society’s Crafty Geek club and its sub-club Make It Sew meet Thursday evenings at the Waterbury Center and invite you to “bring your crafty stuff to do” or to “hang out and work with the crafty stuff we have here!” This Thursday they will be tie-dying “all the things,“ both using traditional dye and using a method with rubbing alcohol and Sharpies. Dye and markers will be provided. When: Friday, July 24th at 8:30 p.m.
She Big Banged Me with Science! When: Saturday, July 25th at 7:00 p.m.
Magers & Quinn Booksellers invite you to join them at Uptown Church on Saturday to attend a reading and talk with Nick Offerman, star of Parks and Recreation and writer of Paddle Your Own Canoe: One Man’s Fundamentals for Delicious Living and Gumption: Relighting the Torch of Freedom with America’s Gutsiest Troublemakers. A complimentary signed copy of Gumption is included with the cost of a ticket to this event (which is $26.95), and Mr. Offerman will be available to inscribe books after the talk. Note: This event is SOLD OUT, so you’ll have to get resourceful if you want to get in on the action! When: Saturday, July 25th at 11:59 p.m. When: Sunday, July 26th at 2:00 p.m. The underground performer posing this month will be Dottie Dynamo, the New York City–based “Loveable Bundle of [expletive deleted] and Trouble” and winner of the Judges Choice Award at the 2014 Arizona Burlesque Festival. At the end of the event, attendees can submit their artwork to be judged by Elektra and Dottie; the artists of their favorite submissions will receive fabulous prizes from sponsors of Dr. Sketchy’s Twin Cities, including Blick Art Materials, Fast Mary’s (Minneapolis-based maker of “bloody Mary enhancers”) and the Fox Den Salon (“your Uptown Minneapolis cool hair shop”), among others.